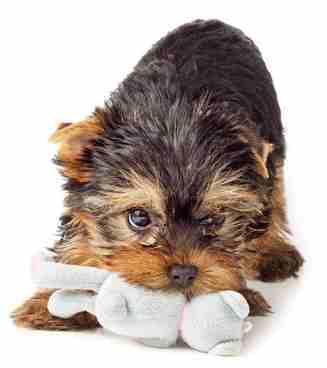 Puppy Teething Symptoms are evident, but for most of us, they may be misinterpreted as annoying behavioral problems. Unlike human babies who are teething, puppies are not likely to cry, run a temperature or get clingy. Rather, you might just notice that the puppy would rather bite you than love up to you. If your puppy is drooling, biting, chewing, or bleeding from the gums, there is a good chance that he is in the throes of teething. There are some telltale signs your puppy might be teething. First of all, don’t panic! Bleeding is minimal and you might not even notice this sign, but a telltale sign is there are drops of pinkish blood on favorite toys. Teething can be painful and those drops of blood will help us remember that what the puppy is going through is not a bad behavior stage. This is undoubtedly the most visible outward behavior. Chewing on anything –preferably chew toys, but most puppies will find other things to chew on as well. Your shoes, furniture, woodwork, sticks from outside, anything within reach is fair game. Chewing helps relieve some of the pain associated with new erupting teeth. If you notice more saliva than usual, there is a good chance that new teeth are trying to erupt. Even if you don’t notice the actual saliva, you will probably feel his wet face or see more wetness on his bed or wherever he sleeps. Sometimes you will see areas in your dog’s mouth where a tooth has fallen out or you might even find the tiny baby tooth on the floor. Don’t worry if you can’t find these teeth, as many are swallowed without any problems. Puppy Teething Symptoms can include refusal to eat. Some puppies lose their appetite or refuse to eat. You might confuse this behavior with some other health issue, but if they are otherwise healthy, the chances are that eating causes some pain. Sometimes they will run a low-grade temperature, cry or whimper. If you do take your puppy's temperature, remember that the normal canine temperature is 101 to 102 degrees Fahrenheit. Anything above that could suggest fever. Not all puppies have fever, cry or whimper. It is important to know the sequence of teething in dogs so you will be able to determine if a concerning behavior is a health issue or misbehavior. Teething is a natural process and should pose any problems. With that said, some issues can pop up, but we will discuss those shortly. With rare exceptions, most puppies are born without teeth. By three weeks of age, sooner for larger breed puppies, tiny teeth begin to emerge. First come the incisors, then the canine teeth and finally the premolars. There are no molars at this point. The last premolar erupts between 8 and 12 weeks, usually about the same time that a puppy goes to his forever home. Puppies have 28 deciduous or baby teeth. Baby teeth remain until about five to eight months of age. After about three or four months, the pup begins to lose his baby teeth and the permanent teeth erupt in the same order as the baby teeth: incisors, canine teeth, premolars and eventually the molars. By the time the puppy is 8 months old, the teething process should be complete. The average adult dog has 42 teeth, 22 on the lower jaw and 20 on the upper jaw. If you count, on each jaw there will be 6 incisors, 2 canines, and 8 premolars. There will be 6 molars in the lower jaw and 4 on the upper jaw. If you ever wondered how shelter workers can tell you the approximate age of the dog, it is by counting the teeth. There are some things you can do if you are aware that your puppy is teething. Now is the time to stock up on puppy toys. Hard plastic toys, rope toys, Kongs, and other chews are all necessary at present and should be readily available. You might not want to put them all out at once but rather rotate them. 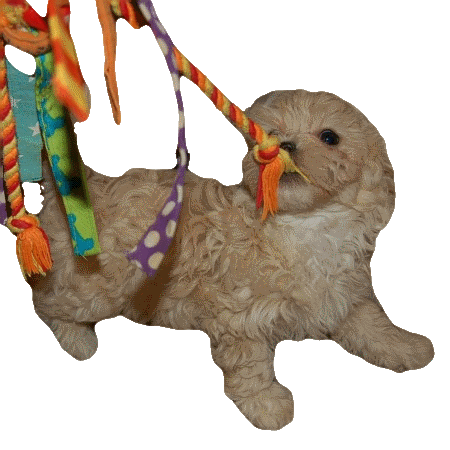 The novelty will encourage the puppy to play with and chew on them more frequently. Some dogs love soft toys such as stuffed animals or stuffless toys. These are also good to have around during the teething stage. A lovely homemade toy that works well for teething is to braid some old rags together into a long rope toy. These can also be frozen for a different tactile sensation. Dip a plastic toy in peanut butter or other tasty paste/liquid and freeze. You can even do this with rope toys. Dip a rope toy in a meat broth, water from a can of tuna, or a thin gravy and then place in a plastic bag and into the freezer. A small washcloth can serve the same purpose for teething. Wet the cloth, roll it up and freeze. If you choose to dip the toys in broth, you should plan on keeping the puppy confined to a small area while they enjoy their treat. It can get very messy. If you have already started to brush your dog’s teeth, you might want to use a piece of gauze dipped in a dog toothpaste and wrapped around your finger. The finger massage will feel good to the dog, but a toothbrush may hurt. Keep the toothbrush in the closet until the process of teething is complete. It is never as important to puppy proof a home as during the teething phase. Anything that is within reach is a fair target to chew in a puppy’s mind. 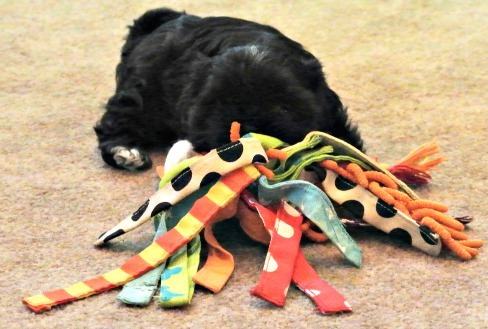 One of the biggest of all puppy teething symptoms is chewing on everything. It is not that they are deliberately naughty, but rather they are exploring and when they find an object that relieves some of their pain, they are going to check it out. Figure out how tall your puppy is when standing on his back to legs. Any object from that height down to the floor is fair game. This means electric cords, chargers, children’s toys, furniture legs, wooden doors, baseboard or molding—wood is generally a favorite, but upholstered items might also be sampled. Don’t forget that everyone in the household must be diligent about leaving things on the floor ~ shoes, boots, cell phones, eye glasses, papers, books, well, the list just goes on and on. Don’t allow a puppy to teeth on you or another person. 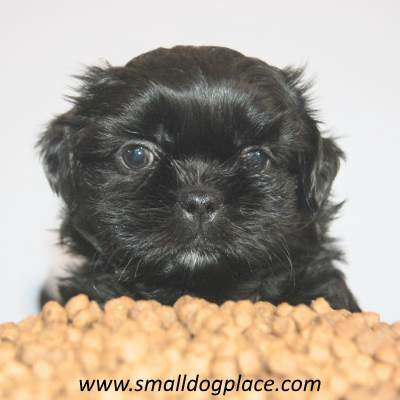 Some people make the mistake of allowing a small puppy to mouth their fingers, hands, or even feet. This habit might be hard to break later down the road, so it is best to avoid it from the beginning. Litter mates learn to inhibit their bite through rough and tumble play. If a sibling is bitten too hard, he’s likely to cry out alerting the other that he must learn how to play with a softer mouth. If this doesn’t teach the puppy, then the mother will. Once the puppy goes home to his forever home, it is up to us, the humans to continue on with these puppy lessons. There are plenty of chew toys on the market that it really isn’t necessary for people to assume the role of teething toy. While most puppies emerge unscathed with a full set of adult teeth, some breeds are prone to some problems. These are not your normal puppy teething symptoms, but I've included them here because they are somewhat common in small breed dogs. If you see what appears to be extra teeth, there is a good chance that the dog has retained a baby tooth. This is notoriously common in small breed dogs. If the baby tooth does not fall out, eventually the adult teeth are pushed out of line and cause a bad bite or malocclusion. It is important to check the puppy’s teeth periodically during the teeth process and alert your vet if a tooth does not fall out. 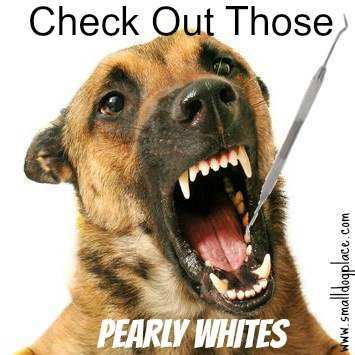 Many vets will routinely pull out any baby teeth at the same time that they spay or neuter the puppy. This saves the dog from having to undergo general anesthesia more than once and also saves you money too. Most breeds have their entire 42 teeth by the time they reach 8 or 9 months old. Some small dogs, especially the brachycephalic breeds may not have as many molars as their longer palate cousins. You probably won't see any puppy teething symptoms, but some hairless breeds such as the Chinese Crested may also have missing teeth. Most of these problems are hereditary and do not pose a health risk to the dog. In some breeds, missing teeth may be a disqualifying fault in show dogs. Some breeds even have more teeth than they should. Greyhounds, for example, may have extra teeth that crowd out or overlap healthy teeth. Teething in puppies is just a phase and all dogs do grow out of it. How we handle this pup development stage does have an impact on future behaviors. Once this phase is over, chewing should diminish, dogs should be less likely to nip on your fingers, and much of the destructive behaviors are gone. If they are still present, it is time to consider them to be behavioral problems that should be addressed.